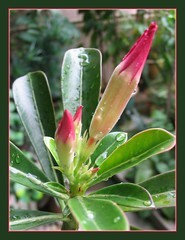 Our tropical flowering plants continue to delight us with their beautiful and colorful blooms throughout the whole month of May. Even the foliage plants wanted to make their dramatic presence known with their luxuriant growth and variegated/green paint! 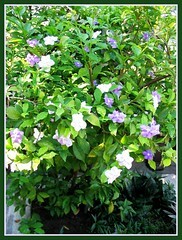 But THE FLOWERING BUSH OF THE MONTH is definitely the Brunfelsia calycina with their gorgeous scented blooms! Amazing – so many colors appearing on the lovely bush at the same time, as displayed in this picture of Yesterday-today-tomorrow! I gave this bush a heavy haircut (prunning lots of its branches by 1.75 to 2.5 feet shorter) during the third week of April and in less than 2 weeks later, it burst forth into a fabulous floral bush, sprouting new shoots too (as seen! 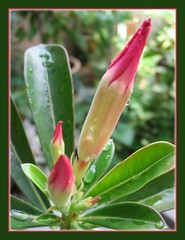 And it had not stopped flowering until this day, almost a month enjoying its beauty and be drowned in its fragrance!